Credit card and Debit cart purchase can be made using your Visa, MasterCard, Discover, American Express or E-Check through Square and Paypal Express Checkout. To use the shopping cart, simply click on the "Add to Cart" button next to the item you wish to purchase. When you are finished shopping, click on the "View Cart" button and complete the check out process. Florida Residents will have 7.5 % Sales Tax added to the total of the items before shipping cost. Your order will be processed once payment is received and has cleared. All money order payments must be in US Funds. To order by Money Order please complete the shopping cart and choose money order as your payment form. Florida Residents will have 7.5 % Sales Tax added to the total of the items before shipping cost. The address to mail your payment to and payable to info will be displayed at checkout. Your order will be processed once payment is received and has cleared. The price of the custom commissioned fantasy cat painting will be determined by size, level of detail, style and medium. Please e-mail me at contact@tigerpixie.com to discuss your requests and wishes for your custom painting. Please be sure to contact well in advance of any deadline since I do have a waiting list. After we discuss the details of the painting, I will quote you the total price for the work with shipping costs. I will place you on the waiting list and give you an approximate date that we will begin working on your commission. Once I begin working on your commission I require 50% of the total up front to cover material costs and as a deposit. You will be sent by email sketches for approval before painting begins. I will also send you images by email of the painting in progress. I will make as many revisions as necessary until you are 100% happy with the painting. You will also receive digital images by e-mail of the completed painting to you for your approval before sending you an invoice for the remaining total amount due. Once started most commissions can be completed and shipped within 4 weeks, unless otherwise stated when you place your order. Please see the Commissions page for more information. You may pay for your commission by Visa, MasterCard, Discover or American Express through PayPal. I will send you an invoice with the total. Please specify in your email if you prefer to pay by money order (US funds only). I will then send you my address to send your money order payment to.. I will then send you a confirmation email with the address to mail your payment to and I will let you know once your payment has been received. Yes, I do offer a Layaway / Lay-by plan for my original paintings. Please e-mail me at questions@tigerpixie.com with the info on which painting you are interested in using Layaway / Lay-by to purchase. I will reply to your e-mail with my full Layaway / Lay-by terms as soon as possible. Wholesale purchasing is only available to registered wholesale vendors. Would you like to wholesale my products? Please Register to become a vendor and I will send you information shortly about your approval. Shipping will be after your payment clears. Items are typically shipped out within one week of order. Shipping costs vary based on what is ordered and where it is being shipped to. Shipping options for your order will be presented to you before checkout. All orders are shipped through the US Postal System, First Class Mail, Priority Mail or First Class International. All smaller prints, framed or gallery wrapped original paintings and gallery wrapped custom commissioned paintings are mailed in a sealed protective plastic sleeve, between two heavy pieced of cardboard in a sealed photo mailer, to ensure their safe arrival to you. All larger prints, flat original paintings and flat custom commissioned paintings are mailed rolled in a sealed protective plastic sleeve, inside an art mailing tube. Smaller items like jewelry, magnets & keychains are mailed in bubble mailers for protection. Open Edition fine art prints are full color, professional quality prints from my original watercolor, ink, colored pencil, pencil and acrylic paintings. They are printed on heavy weight water resistant glossy photo paper. • 8" x 10" image size fits a standard 8" x 10" frame or mat. The image is printed on an 8.5" x 11" glossy photo paper. • 5" x 7" image size fits a standard 5" x 7" frame or mat. The image is printed on an 6" x 8" glossy photo paper. • 11" x 14" image size fits a standard 11" x 14" frame or mat. The image is printed on an 13" x 19" glossy photo paper. • 12" x 16" image size fits a standard 12" x 16" frame or mat. The image is printed on an 13" x 19" glossy photo paper. All Prints are signed on the back by me including the title. They are sold unmatted and unframed to be left to the buyers choice. All prints come in a clear re-sealable sleeve. The 8" x 10" & 5" x 7" prints come with a backing board unless they are being mailed in a tube with a larger print. 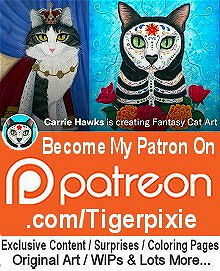 My Original Artwork currently available for sale can be seen here, Original Fantasy Cat Art. The original artworks are signed on the front by me and also signed on the back by me including the title and date. They are sealed with a light coat of UV resistant spray varnish to enhance and protect the colors. All are sold unmatted and unframed to be left to the buyers choice. Each paintings size and medium is listed on it's details page. Full color professional quality Limited Edition 11" x 14" Gallery Wrapped Glossy Giclee Canvas Print with Hand-painted Embellishments! Highly collectable Limited Editions! Only 75 of each painting will ever be made! They are truly One Of A Kind! Since each canvas is hand-embellished, no two will be identical! They really look just like the original painting! No frame is needed! The canvas has a hanger and is ready to display. How I create each canvas print; It is a 3 day process to complete one of these canvas prints. The image is printed with my professional quality giclee printer on a sheet of prepared artist's canvas. Then I add hand paint details of the image with acrylic paint and hand sign and number the print. The canvas print is then hand coated and set with a UV protectant giclee varnish shield giving it a glossy finish just like the original painting. Last, the canvas is stretched onto 3/4" stretch bars with staple-free sides that are black. The back of the canvas has a sawtooth hanger and is ready to display and is also signed by me, the artist, including the title date and edition number. I would also be happy to personalize the back of the canvas at your request. Edition Number, Signature & brushstrokes will vary since these are hand embellished. The earrings feature a classic style scalloped bezel with silver plated overlay & surgical steel ear hooks. My fantasy cat images is set under a clear cabochon. The earrings measure 25x18mm (about 1 inch tall & 3/4 inch wide with the setting) The earrings are packaged on a backing board in a clear resealable sleeve. The cuff bracelets feature an oval bezel with silver plated overlay. My fantasy cat images is set under a clear cabochon. The cabochon measures 25x18mm (about 1 inch tall & 3/4 inch wide with the setting) The cuff easily bends to accommodate different wrist sizes. The bracelets come packaged in a sheer Organza drawstring bag. The rings feature an oval bezel with a silver colored overlay. My fantasy cat images is set under a clear cabochon. The cabochon measures 25x18mm (about 1 inch tall & 3/4 inch wide with the setting) The ring easily bends to accommodate different finger sizes. The rings come packaged in a sheer Organza drawstring bag. Colorful Note Cards of some of my favorite fantasy cat artworks. These beautiful art print quality greeting cards make great gifts & are perfect for framing as mini prints! They are printed on heavyweight glossy photo paper, measure 5 1/2" x 4 1/4", include envelopes & are each individually wrapped in a clear re-sealable sleeve. The inside is blank leaving lots of room for you special messages. The back has the painting's title and Tigerpixie Art Studio info. Orders of more than 4 cards come tied with a matching ribbon. Purrrfect coloring fun for all ages! Created by me, the artist, each image is printed on a sheet of 8.5" x 11" matte acid-free heavyweight card stock, to be colored with colored pencils or artist markers. The gift set comes with all 10 pages with a front and back cover page as shown in a clear re-sealable sleeve. The cards made by me, the artist, measures 5 1/2" x 4 1/4" and are printed on matte acid-free heavyweight card stock, to be colored with colored pencils or artist markers. Each includes an envelope & are individually wrapped in a clear re-sealable sleeve. The inside is blank leaving lots of room for you special messages. The back has the image title and Tigerpixie Art Stufio info. The gift set comes with all 10 cards and the front & back cover image tied with a matching ribbon. *Copyright policy: These coloring pages and note cards are for hobbyists only, and can not be reprinted or resold. I remain the copyright owner of the images. These coloring pages are for use by hobby artists and crafters for their own personal use in their homes or for gifts for loved ones. Beautiful magnets featuring my fantasy cats, handmade & packaged by me, the artist. The images are printed on heavy weight water resistant glossy photo paper and are encased in a thick clear acrylic frame. They measure approximately 2.25" x 3.25" and have a strong magnet attached to the back and as an added bonus the magnets also have a small fold out stands to display standing on desk or shelf. The magnets are packaged in a sealed clear sleeve. Licensed Products - Crosss Stitch patterns, Wall posters, etc. Many of my favorite cat artworks are available as counted cross stitch patterns at Heaven & Earth Designs. These patterns are NOT computer generated. Each pattern image is painstakingly hand graphed using engineering software for an underlay, thus producing a relatively clean chart with minimum "confetti" stitching. All charts are offered in two formats - one which is regular format & a Large format for the chart that is easier to read. They are all available for purchase in both "Smail-Mail" or E-mail format. High quality prints and greeting cards of my most popular fantasy cat images. Imagekind has all sizes of prints to pick from. Also your choice of different high quality papers for both prints and greeting cards. Custom framing for your print is also available too! My cat art is featured in several books & magazines! "Artwanted.com, Creative minds", "Enchanted Artists; Visions of Atlantis", "500 Fairy Motifs", "Fairy ; The Art of Jasmine Becket-Griffith", "Faeries Through The Season" & Mystic Pop Magazine! Most recently the very popular coffee table book, "Big Eye Art: Resurrected and Transformed"!